America has long prided itself as being “A Nation Of Laws.” But, unless the American people and the followers of Obama wake up soon, that will swiftly and surely become a false pride based on a lie. If President Obama is allowed to finish as he has started the rule of law will have ended in America, to be replaced by a de facto autocratic rule by the Executive. Yes, the Liberals could say President Bush was guilty of this as well – so? If it was wrong then, it should still be wrong now. President Obama, in a bid either to fulfill some of his campaign promises or to just further his agenda, has apparently chosen to use his appointees in the Executive branch of our government to flout and / or circumvent the laws enacted by Congress. 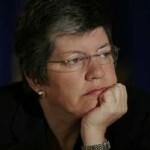 Homeland Security Secretary, Janet Napolitano is enforcing Obama’s policy of not arresting illegal immigrants in direct contravention of standing US federal law. US Attorney general Eric Holder is enforcing Obama’s policy of not raiding medical marijuana clubs in direct contravention of standing US federal law. Two of the most important of President Obama’s appointed subordinates – neither position being an elected one – the Homeland Security Secretary and the US Attorney General, are directly contravening current US law at the order of President Obama. This selective enforcement of American law is essentially a tacit line-item veto of Congressional legislation and represents both a power grab by the Executive branch and a violation of US Constitution which guarantees a Separation of Powers. One of the principal responsibilities of the President and his subordinate Officers as stated in the US Constitution is to “take care that the laws be faithfully executed,” not to create laws, remove laws, or circumvent the enforcement of law duly enacted by Congress. President Obama’s contempt for the law and his apparent desire to further consolidate power into the White House is made even more serious in the light of his unilateral decision to create White House offices on the US Census, Health Reform, Urban Affairs, and Energy & Climate Change. Americans also need to fear what Obama will do when it comes time to appoint Supreme Court Justices. A President with Obama’s views� may well create a SCOTUS worse than the Warren Court. The American people and the followers of Obama need to open their eyes and truly see what is being done to them. We should not be supporting these actions; we should be denouncing them in the strongest terms and in the strongest means available to us. If we’re not wiling to do so, then we need to never again claim that “America is a nation of laws” and accept the yoke of our new masters. 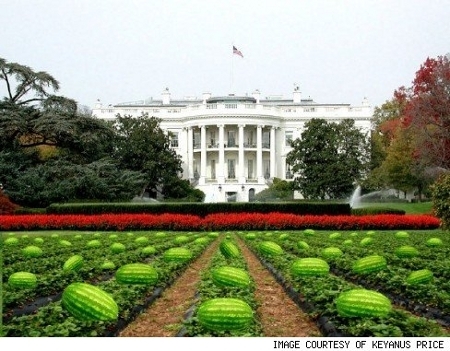 Dean Grose, the soon-to-be-ex mayor of Los Alamitos has come under heavy fire for sending an e-mail out that depicted the White House lawn planted with watermelons, under the title “No Easter egg hunt this year.” Among the recipients – all of whom were apparently intended recipients – was local businesswoman and city volunteer Keyanus Price, who is Black. As I have commented before, sometimes an image is just image whether it be that of a chimpanzee or of a patch watermelons, bucket of fried chicken, or whatever. Such is not the case in this situation. The message in Grose’s email cannot be interpreted in any other way than as a cheap joke based upon racial stereotypes. It directly referenced President Obama and used imagery that, in that context, can have no other plausible meaning other than as a racial slur. I should really thank Mayor Grose for providing such a good example of an actual racist cartoon or joke by way of counterpoint to the Post’s cartoon. Mayor Grose also didn’t make matters any better when he responded to Keyanus Price’s initial complaint about the emailed image and it’s caption. Yes, sometimes the cries of racism are little more than a combination of people nursing age-old grievances and bitterness and the vicious and mercenary actions of creatures like Al Sharpton and his ilk. But that sad fact doesn’t mean that racism isn’t still prevalent in America, as Mayor Grose’s stupidity and bigotry clearly shows. President Obama’s handpicked US Attorney General, Eric Holder has announced that he will forbid the Federal Bureau of Investigation (FBI) and the Drug Enforcement Administration (DEA) from conducting any more raid on medical marijuana clubs. Attorney General Eric Holder said at a press conference Wednesday, February 25, 2009, that he will no longer allow the Justice Department to raid medical marijuana clubs that are established legally under state law.� His declaration is a fulfillment of a campaign promise by President Barack Obama. The Drug Enforcement Administration (DEA) continued to carry out such raids in accordance with federal law, despite Obama’s campaign promise. Holder was not pleased by this at all. No, what the President said during the campaign, you’ll be surprised to know, will be consistent with what we’ll be doing in law enforcement. He was my boss during the campaign. He is formally and technically and by law my boss now. What he said during the campaign is now American policy. Strange, the last time I looked into it enforcing US federal drug laws and arresting drug dealers was the sworn duty of the Drug Enforcement Administration (DEA) officers and the Federal Bureau of Investigation (FBI) agents. Of course I erroneously believed that it was the sworn duty of the Attorney General to support them in those efforts. So…The person in charge of the Department of Justice and therefor the FBI and the DEA regards raiding drug commissaries that are illegal under US federal law s a violation of the policies of the new federal government? This is not something that any American should feel the least bit comfortable about. There is a certain view of God and nature and man and the world in the background of our faith. But Christianity is a historical religion, and a religion of experience. It is grounded in facts. The Christian worldview rests upon these facts. From the fact that other religions, including Judaism, have in them the idea of sacrifice and propitiation, it is concluded by some that it must be a false idea. Fundamentally this assumes that everything in the non-Christian religions must be wholly false. Is it not far more likely that a universal religious idea has in it an element of truth than that its universality is a mark of its falsity? Christianity purified and fulfilled all religious ideas of human beings, emptied them of their transient and superficial meanings, and revealed their true inward meaning. The atonement of Christ in a very special manner does this. In it God appears in Christ, not as a distant, implacable and angry being, requiring a satisfaction for sin which humans cannot supply. Jesus himself, as holy and loving and yearning to save humanity, provides the satisfaction. Obviously as a Pagan I have a theological difference of opinion with Rev. Dr. E.Y. Mullins’ assertion that “Christianity purified and fulfilled all religious ideas of human beings, emptied them of their transient and superficial meanings, and revealed their true inward meaning,” but his wisdom in knowing and saying aloud that universally held religious and moral concepts are more likely to be true than false and that things outside of the Christian faith are not inherently wrong just for being outside the Christian faith is profound. Homeland Security Secretary Janet Napolitano was angered by the fact that U.S. Immigration and Customs Enforcement (ICE) agents this week conducted their first work-site raid since President Barack Obama took office. She angry because arresting illegal immigrants violated her and President Obama’s policies regarding immigration. Sean Smith, a spokesman at Homeland Security in Washington, D.C., said that Napolitano is demanding answers.� Napolitano herself said, “I want to get to the bottom of this” and is planning on conducting an investigation of the February 24th raid. Strange, the last time I looked into it enforcing US immigration policies and arresting and deporting illegal immigrants was the sworn duty of the Immigration and Customs Enforcement officers. Of course I erroneously believed that it was the sworn duty of the Homeland Security Secretary to support them in those efforts. So… the person in charge of US Homeland Security and therefor U.S. Immigration and Customs Enforcement (ICE) regards arresting 28 illegal immigrants at Yamato Engine Specialists factory in Bellingham, Wa. as a violation of the policies of the new federal government? This is not something that any American should feel the least bit comfortable about. Sadly it seems that National Council of La Raza – the political arm of MEChA – has more to be happy about than just their recent $473,000 “not-an-earmark” in the Stimulus Act.� They’ve apparently got the sympathy of the Homeland Security Secretary as well.